Sunset Bluffs is ideally located in the growing and vibrant Holly Springs / Fuquay-Varina area of southwest Wake County. 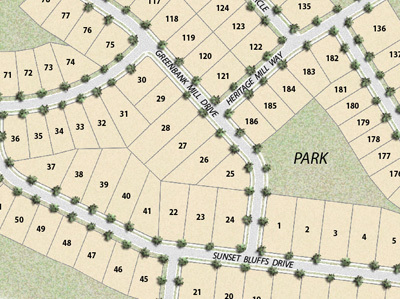 Attractive shopping and recreational destinations, as well as several schools, are conveniently located nearby. Major employment centers in the Research Triangle Park, Cary, and downtown Raleigh are all within easy driving distance. From the North: Hwy 540 to Holly Springs/Fuquay Varina exit at Hwy55. Turn Left on Holly Springs Rd. 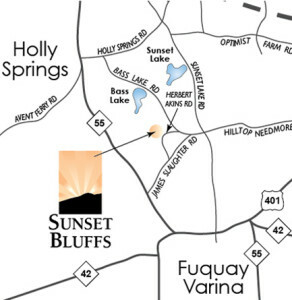 Right on Sunset Lake Road, Right on Bass Lake Road, Left on Herbert Akins Road and Sunset Bluffs is on your Right. From the West: Hwy 55 to Dickens Road, Left on James Slaughter Road, Left on Herbert Akins Road and Sunset Bluffs is on your Left. From the East: 401 South To Right on Hilltop-Needmore Road, continue on Bass Lake Road, Left on Herbert Akins Road and Sunset Bluffs is on your Right. From the South: Sunset Lake Road North to left on Bass Lake Road, Left on Herbert Akins Road and Sunset Bluffs is on your Right. Sunday 1 pm – 5 pm or by appointment. To schedule one, contact us today. Association Dues: $260 / yr.
For current school profile information visit www.wcpss.net. 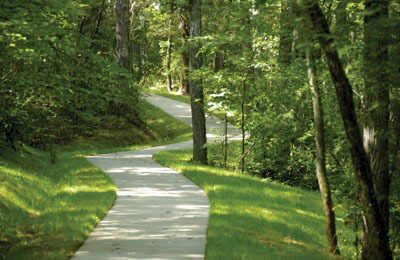 Like its sister neighborhoods of Sunset Ridge, Sunset North and Sunset Oaks, the development management of Sunset Bluffs is being handled by Bryan Properties, Inc. Bryan Properties has been managing the development of award-winning and nationally recognized master-planned communities in the major metropolitan regions of North Carolina since 1984. 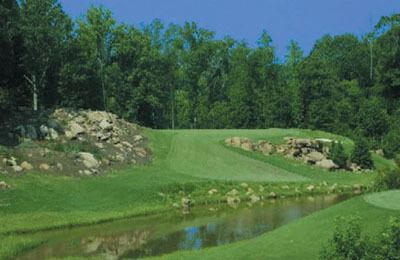 To learn more about the firm and its experience and portfolio of developments, please visit www.bryan-properties.com .